The essence of a legend. 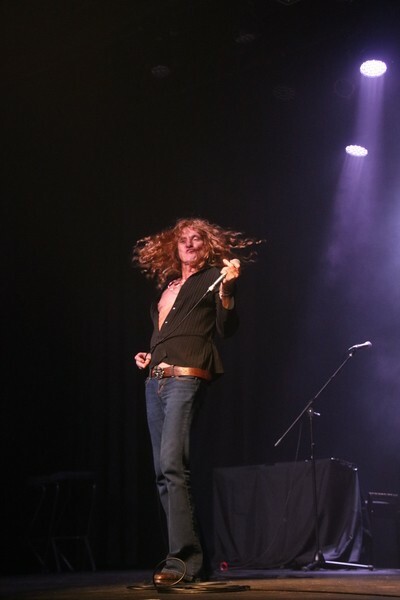 Michael Anderson channeling Robert Plant is truly something else. Led Zeppelin fans – be on notice. You are about to witness the legendary British supergroup in all its glory and excesses, right here in Noosa. Widely hailed as “the best Led Zeppelin band on the planet,” (Dennis D’Amico, Exec. Prod. Paul McCartney), THE LED ZEPPELIN EXPERIENCE, Hammer of the Gods Tour is pounding its way to a venue near you in October/November/December 2018, all the way from Seattle US. The band, formerly known as No Quarter has been wowing audiences all over the world in their authentic tribute stage show for more than 15 years and has shared the stage with such legendary artists as Peter Frampton, Foreigner, Steppenwolf, Loverboy, Jefferson Starship and many others. Band members take on the characters of John Bonham, John Paul Jones, Jimmy Page and Robert Plant and bring each of them to the stage in their absolute prime. This is more than a tribute act, THE LED ZEPPELIN EXPERIENCE capture all of the subtle nuances and mannerisms of the characters they are representing just like actors in a film. Fans who have seen the original band will think they have returned and will have the opportunity to relive the magic. Fans who never had the chance to witness the supergroup won’t believe their luck and will finally get to experience the iconic and ground breaking stage show for the first time. “If in fact you have never seen the real Led Zeppelin in concert, seeing these guys live is as close as one can get. They have all the moves, they know every note of every song. It is just amazing how well they impersonate the real thing,” John Tuckness, Daily Herald, Chicago. THE LED ZEPPELIN EXPERIENCE, Hammer of the Gods Tour features Michael Anderson channeling Robert Plant on vocals – Nathan Carroll portraying drummer John Bonham, Chad McMurray playing bassist/multi-instrumentalist John Paul Jones and the fleet-fingered Byran Christiansen as Jimmy Page. The British supergroup famously refuses to reunite following the death of John Bonham in 1980 other than a one-off gig in 2007. THE LED ZEPPELIN EXPERIENCE has stepped into the breach, keeping the band’s fans satisfied and the spirit alive. Witness a moment in history come to life and don’t miss the pounding, haunting experience of THE LED ZEPPELIN EXPERIENCE, Hammer of the Gods Australian Tour.